I don't know why it took me so long to make a pilgrimage to Chaco Canyon, New Mexico. I knew Chaco Canyon's community was unlike anything in the southwest. It was unique to itself in architecture and culture. Even the Hopi and other native living peoples do not know who the Chacoians were, why they built what they did, and most of all, why they left. Archeologists today can only hypothesize answers to these unanswered questions. Oddly enough, Archeologists say that the last of Chacoans left the area about 800 years ago. I remember that the last of the Star Elders left the Earth about 800 to 900 years ago in a site called Quirigua. Some of the Star Elders traveled north around this time to the Chaco area. Chaco Canyon and the last of the Classic Maya sites were abandoned under very mysterious circumstances. This is no coincidence. I only knew three things about Chaco Canyon. It was the furthest north that the Star Elders had traveled to; the existence of a sun dagger, and a solar calendar at the top of Fajada Butte. Oh yeah . . . one other thing . . . I knew about its infamous, remote location with the long and bumpy, wash board, dirt roads that can rearrange your brain. Yet, after living in the southwest all my life, I finally made the journey to where it all ended . . . and yet strangely where it all begins. Joining me on this adventure was my partner, Raphael, and three trouble makers, Linda, Laura and Terry, from our recent Maya pilgrimage to Tikal and Copan. After our rendezvous in a little pueblo call Cuba, we all headed out to the Canyon. I remembered that the Star Elders always picked remote areas to do their studies of Earth so as not to be discovered. These areas included forsaken desert, un-penetrable and dangerous jungles and towering mountain tops. Chaco is a perfect example of this. Chaco was a meeting place for very private gatherings of wisdom keepers and initiates. We see still see echoes of this behavior in the privacy of the Hopi Kachina dances. We arrived at Chaco Canyon visitor's area and began our investigation using what I call Spiritual Archeology. You dig with your heart, and try not to rely on your five senses, like your sight and hearing. All these can detract from the truth. The first message that I got from the site was one I didn't want to hear. The Star Elders said "They shut the site down!" So I thought that I came all this way, and there is nothing here. There was no energy. It was empty . . . strangely mysteriously empty . . . like something was there, and now it is not. This was a huge let down for me. I was expecting strong impressions like I felt in the Maya, Inca and Egyptian worlds. I have learned over the years that the Southwest sites have always made me pay my dues. I really have to work to hear the memories left in the Southwest. Everything we do on the Earth is imprinted in the Earth's memory. When you go to a sacred place, we are influenced by echoes of these memories. If you work with these memories and feelings, what you are doing is what I call Spiritual Archeology. Sacred sites shift energy from day to day, week to week, and century to century . . . just like the Earth does. Earth felt quite different 100 years ago and was markedly different 800 years ago. When you go to a site multiple times, you begin to see the shift and changes in the energy. This is how you can tell what changes are coming to the Earth. It is how the ancients foretold events also. New energy enters the Earth from the great central sun to energy / power points on the Earth . . . then it spreads across the landscape. Many of these energy points are clearly marked with sacred sites built by ancient cultures. Many of these sites are not marked at all. The first time you go to a sacred site you receive what I call your base line. 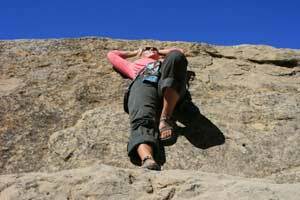 A base line is the first energy you feel in a site. It becomes the measuring stick in which you measure shifting energy when you return to the same spot. I knew I was getting my base line for Chaco, and it wasn't that exciting. It was more like a flat line. My base line for Chaco was vacant, unoccupied by any spirit, expressionless, bare, deserted and windswept nothingness. But in this stillness, I could feel a surge of energy hitting my heart area. I felt like I was sinking into the Earth. It is the same feeling that you have just before you leave your body and astral travel. You feel really heavy, and then you lift out of yourself. I think I was feeling the energy of their exit back to the stars. It looked as if their exit was the only memory they left behind. The stillness also reminded me of the center of the butterfly. The only thing that does not move on a butterfly is the body. The wings flap to keep the center airborn between earth and sky. I began to feel that Chaco Canyon was and still is a profound, center point of stillness in which all things return to the center point of stillness. All energies are merged into one and the same. We began to explore. I just let my mind go and watched what would cross my mind. If you TRY to hear a site, you will only push the memories away. You have to LET GO to GET IT. We hiked the Una Vida site trail, and I felt some energy that reminded me of the Amaru Meru's doorway in Peru. I wasn't expecting that feeling. Peru? Here? Amaru Meru's doorway is where you could enter another dimension with your physical body. As we walked, I began to feel very subtle influences from all over the Americas. It was becoming quite apparent to me that Chaco was a gathering place for people from all over the America's. I could still hear The Star Elders echo to me "They locked the place down a long time ago." I thought "Why are they telling me this again? Do they want me to turn around and go home?" Then they added that Chaco is a place that will test you . . . not only us today, but also the people that lived here in the past. It teaches you how to use highly refined, subtle energies that could only be felt in such a remote, isolated place. We went on to the famous Pueblo Bonita, and we ran into a man with a dog named Angie. He had just moved back to the states from Roatan in the Honduras and was touring the southwest again. We had just returned from Roatan ourselves. We started a friendly conversation. He said that if you listen carefully, the ancestors will talk to you. I told him that is what we were doing, and that I had heard that the place was on lock down. He was told that he needed to find the key, and immediately started to tell us about a keyhole kiva. 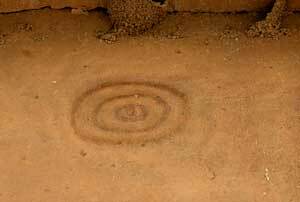 A kiva is a round ceremonial room that is usually sunk into the earth. He showed us the spot in Pueblo Bonita where there is a kiva that is made in the shape of an Omega (a keyhole). We thought that by being there, we would be able to unlock the energy of Chaco. It was a clue, but it turned out that it wasn't the answer that we were looking for. I didn't feel anything in the keyhole Kiva. 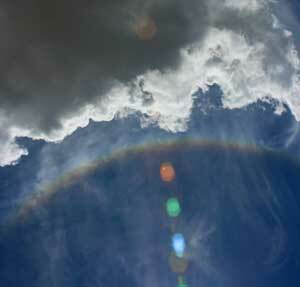 When we looked up thre was a amazing sun dog in the sky. Thi is a a great omen! So we had to search on. While at the keyhole, we ran into an archeologist who started talking about the post Classic Chacoan and what the modern Puebloans felt about it. He said that they felt that the people became too powerful, and they had to shut things down. The people were putting too much faith in a select group of people. I felt he approached things from a very practical western point of view. But I also know that messages and clues can come from anywhere, and archeology can mirror the truth in many cases. The archeologist said that the people got too powerful and they had to leave, and that was actually kind of true. They had so much power, and they knew that the Earth would be going through cycles of darkness which would be a rebirth for the Earth. The energy that these ones carried couldn't exist on the Earth, because it would just magnify the darkness and the intensity of the cleansing. It would be like an atom bomb . . . an unleashed atom bomb. So this site wasn't shut down because the energy was being misused . . . it was locked down because their energy couldn't be here while the Earth was going through its rebirth cycles. In the past the Star Elders have said that sacred sites were abandoned in the Americas over 800 - 900 years ago. They knew their energy would unnecessarily intensify the coming dark ages on Earth. This energy was and still is the power of instant manifestation. It instantly creates what is in your heart. Humanity was not quite ready for this level on manifesting 800 years ago. So the sites were purposely abandoned and locked down. The wisdom and energy was anchored in time capsules that were connected to alarm clocks of sorts. They tried to erased this wisdom from the Earth's memory. The ancient sites were to be reopened at a future time. This opening began slowly in the late 1930's, even further in the mid 50's and again in the mid 80's. But 2008 was the blast that open it all up again. Several of the Kivas in Pueblo Bonita had 6 columns in them. When you connect these columns in the shape of 2 diamonds interconnecting, you basically have the shape of a merkabah that anchors a cosmic solar merkabah to the Earth. The Maya site of Palenque also has an Earth merkaba that is even more powerful. These two Kivas also reminded me of the Chulpas in the Lake Titicaca area of Sulustani. I was getting the sense that the setting sunlight came through an opening in the canyon in the west and came across the northwest corner of Pueblo Bonita. I felt that the energy/wisdom of the sun was collected in the buildings at summer solstice, captured and reflected back off the canyon walls behind the Pueblo. It was like a giant solar collector. The energy that was gathered was used to speak to the Sun. Communicating with Sun allowed the Chacoan's to communicate with their home base. Solstice was when they got a good, solid connection with the sun (Can you hear me now? or ET's "phone home"). The Star Elders said Chaco collected the sound of the Sun. 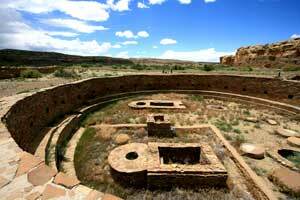 Pueblo Bonita had a staggering seven hundred rooms and thirty-five kivas in its day. That is a lot of storage space. Laura mentioned that she was in Chaco briefly a few weeks prior, and the energy was totally different (similar to the Maya site of Copan). She mentioned that she was in the site, late in the day, around 3:30PM. Perhaps the energy changes in the site during the day. It was clear that Chaco is not a sunrise site. It is a sunset site. Most Maya sites are linked to a rising sun; not a setting one. Because the digging into the memory was so difficult and frustrating, the Star Elders said "Do the zuvuya". A zuvuya is when you look at something from an opposite way to discover a deeper meaning. So I quit thinking about what I felt, and started thinking about what I didn't feel. It is almost like Chaco Canyon is the manifestation of anti-matter. It absorbs a particular quality of wisdom from different areas because it lacks anything at all. Anti matter seems to be arising to the forefront of the collective. It has shown up the new movies like Star Trek where the anti-matter was called the red matter. Angels and Demons also had a story line around anti-matter. Anti-matter is the lack of anything. In science they say that you have cells in your body, and if anything is missing from the cell (e.g. neutrons, protons and electrons), then nature has to replace the missing component. So anti-matter has nothing. Therefore it has to absorb everything. Another way anti-matter can be demonstrated is with the human psyche. When we feel that we have missed something in our childhood, the tendency is to continually try to fill that void. This could be our gift or our undoing. At Chaco Canyon, you don't feel anything at all. Maybe this area of the Earth has the ability to do the equivalent of anti-matter of consciousness. In this way, it would continually attract wisdom from all over the world to keep filling the void. It doesn't feel like memory stays put here. It feels like it comes and goes as the sun rises and sets. It simply passes through. Chaco had very little iron content in its ground. Iron is magnetic, and magnetics store memory. Many ancient traditions speak about being in the present moment or the eternal Now. We are taught to enter a void when we meditate in order to a clean our slates and attract spiritual insights. The Star Elders continued to ask me "What don't you feel? What would you expect to feel here that you don't?" I could feel the absence of food, fire and water. I could not feel or see any evidence of fortification. In other words, there was no enemy to protect against. There were no wars or disagreeing parties here. I didn't feel the ancients coming here or leaving here, directly contradicting the evidence of a huge Chacoan road system. When I sit in a place awhile, I can feel the emotional etheric record left behind by the people that lived here. But there was no etheric record here. I feel it was purposely wiped clean, and this got me interested even more. I was startled at this purposeful emptiness. This place had to have hundreds and hundreds of people, and powerful people at that. Where is their energy? When I walked further into this canyon, I could feel subtle echoes of Atlantis, Egypt, the North Americas, the Inca and the Maya. The Star Elders said that everyone could bring their wisdom here and find a way to merge that wisdom . . . to unify it together into one. The Star Elders say that many wise beings came to the Chaco area and returned to many different power places on the Earth in order to understand and work with the Earth's energy as a whole. They worked to develop ways to be conscious creators by using the Creative Force from the wisdom from different places on the planet. The goal was to gather universal wisdom back together in this place, and store it for future uses. I could feel in some areas the energy of 2 or 3 different, widely separated places on the planet all in one place. They definitely were experimenting with the idea of unification. They were trying to bond different ways of doing things. It wasn't like science or working with natural elements. It was working with the creative power of consciousness. They were experimenting with linking many areas of the planet with others areas. The Star Elders said that they did finish their job quite quickly. It only took them about 300 years to complete. Once they anchored this unified truth and wisdom, it was time to lock the doors until a time in the future to let it out. This time is upon us now! The next day we decided to hike out to the most remote area of Chaco. It meant a four mile grueling hike in the blazing desert sun. We heard about a rare petro glyph of a super nova, and we had to see it. Along the way we viewed each and every petro glyph along the way. Four miles later, and past the super nova, was another remote site. We had to scramble up to the top of a butte to get to it. We had gone this far so we might as well go the rest of the way. It was only another .8 miles. The site was named Penasco Blanco (White Rock). I was worried about our water supply at this point, and we were all pretty toasted with the relentless sun. As we arrived at the site, a gentle cloud cover shaded us as a storm passed near by. What a gift! 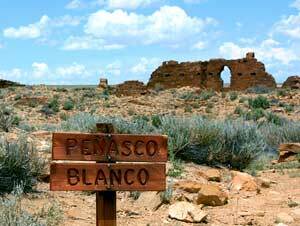 It was here at Penasco Blanco that we finally discovered some remaining energy of the people who lived here. I was delighted at a key hole doorway! Apparently, after three hundred years of collecting and merging ancient wisdom from the four corners of the Earth, it came time for the ancient ones to leave Chaco. The residents of Chaco had completed their work. They had a meeting. They agreed to leave the place totally void of the memory of them having lived and worked in the canyon. They did this to protect their work but also to protect us. They were going to a new world. But these elder women wanted to be remembered. They wanted to leave clues so we to could remember. They were thinking outside the box . . . just like many of us do today. By thinking outside the customary constraints of mechanical mind sets, we can evolve. These elder woman didn't see the wisdom of collecting all this knowledge from the far reaches of the Earth only take it with them. They wanted to leave clues behind so it could be brought back to life sometime in the future. So way out here . . . out of eye and ear shot of Pueblo Bonita, they plotted their rebellion, and decided to leave some memory behind. This memory was anchored with great emotion. Remember, Chaco Canyon has little iron in its soil and rock, and was chosen for its ability to stay clear of any etheric record. So they plotted to anchor their memory with great power through emotion. Their story and their memory was indeed left behind and anchored as they destroyed their belongings. It is a well known fact that when indigenous people decided that it was time to move on, they broke their pots as an act of letting go. Leaving this place was not only breaking the Elder womens belongings, but their hearts as well. I felt their wordless emotion of pain and sorrow enter my heart, but also a feeling of authentic power and wisdom. Enticed by the cool, cloud cover, we had stayed in the site longer then we had planned. Time was running short, and we had to hit the trail for the long hike out of Chaco. As we left the site, the Grandmothers pealed back the clouds, and we had to deal with the blazing sun once again for the 4 mile trek back to our car. I knew I was leaving the site with more than I had arrived with. I learned a couple of things while in Chaco. The era that called for the shutting down of Chaco Canyon is very much like the time that we are in now. We have become proficient with all that we need to learn in this dimension. It is time for us to break some pots, so we can move on . . . even if it is to something better. We must think outside the box to evolve. We can't take this world with us, because we are heading to a new dimension. We must expect the unexpected, and live with an open heart to hopefully be in a state of readiness for what is coming soon. Secondly, we must return to fundamental unity and community in which all teaching and wisdom are honored and respected as a precious part of the ONE. This is a value I hope that will be become the norm again in our world. It felt weird leaving Chaco as we headed to Albuquerque. I could feel I was not the same as I was when I arrived. The grandmother's lingering message seem to come through the radio. It was The Doors singing "break on through to the other side, break on through, break on through, Yeah!" 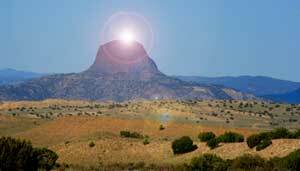 Out of the car window I could see sunrise descend upon what I call "Devil's Tower of New Mexico". It was a surreal moment. I felt lucky that we stumbled onto the land were the renegade women anchored their story to the earth. We paid a physical price for this message, and I find myself hoping I am like them when I grow up. I felt like the old rebels were following me home. They know they are welcome here and I am ready to hear more of their story when they are ready to share. Learn more 3D stuff about Chaco Canyon here.